Measuring Pressure in a Vacuum System - Meyer Tool & Mfg. Figure 1. Pressure ranges spanned by various types of vacuum gauges. The instrument most frequently associated with vacuum systems is a device for measuring the pressure. In a vacuum system, starting from evacuation at atmospheric pressure and eventually reaching high vacuum regimes in the order of 10-10 torr, the pressure range is too great for a single gauge to measure the entire span. Figure 1 illustrates the typical pressure ranges of the most common vacuum gauges. We will discuss each of these common gauges and the factors to be considered in their selection and use. 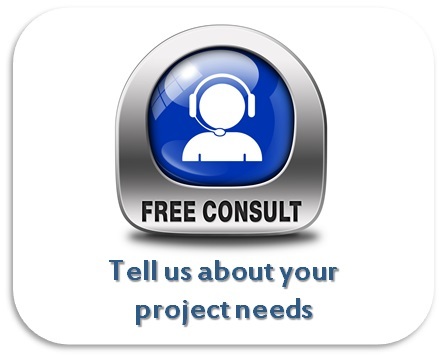 We will use the U.S customary unit, torr, in defining the pressure measurement. Conversion factors from torr to other common vacuum pressure measurement units are available at "Conversion Factors-Pressure Units". Important factors to be considered in selecting the correct vacuum gauge for your application are the range of pressures to be measured, the nature of the background gas, environmental factors such as whether or not a bake-out is required or the presence of ionizing radiation or strong magnetic fields, the accuracy required and the cost. Bourdon Gauges: The most common type of pressure gauges, used for measuring pressures both above and subatmospheric, are based on the Bourdon tube; a length of flattened tubing bent into an arc or a spiral. One end of the tube is fixed to the gauge housing and the other end is connected to the dial by a mechanical linkage. The tube flexes in response to pressure, producing a deflection of the dial. Because they rely on mechanical pressure, the best Bourdon tube gauges are accurate to approximately 1 torr. While they are not useful for the measurement of very low pressures, Bourdon tube gauges are a convenient feature on chambers which must be let up to atmosphere from a source of pressurized gas. They span the complete range from vacuum to 1 atmosphere and provide the operator at the chamber with a local pressure readout that is accurate near 1 atmosphere. Bourdon tube gauges range in cost from around ten dollars for a small 2% accuracy gauge to several hundred dollars for a large, high accuracy gauge with NIST traceable calibration. Strain gauges: Like the Bourdon gauge, strain gauges are also devices which measure direct mechanical pressure. The pressure measurement is independent of the nature of the gas. Strain gauges can be produced by attaching a resistive strain sensor to a membrane which flexes in response to pressure. 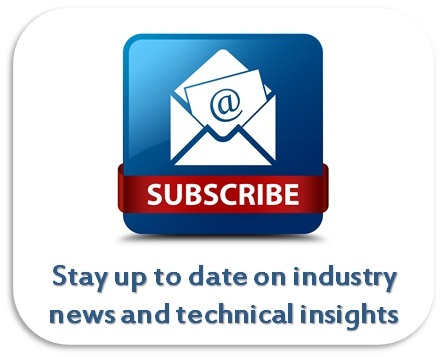 Today most strain gauge sensors are based on the piezoresistance of a silicon semiconductor. Piezoresistance is a change in resistance due to applied stress; however, the change in resistance is due to a change in the resistivity of the material and not simply due to the change in dimensions of the element under the applied stress. Most strain gauge vacuum sensors have a resolution of 0.1 torr and span the full range from 0.1 torr to 1 atmosphere and above. Piezoresistive sensors and signal processing electronics are available on a single chip for approximately fifty dollars. A gauge with power supply, readout and standard vacuum connection such as a KF fitting generally cost several hundred dollars. ​Capacitance manometers: Another direct mechanical based gauge, capacitance manometers measure pressure by measuring the change in capacitance resulting from the deflection of a metal membrane. Because the area of the sensing element can be made relatively large, they are sensitive at lower pressures than other direct mechanical measurements of pressure. They are available with a wide range of scale, accuracy and cost combinations. High accuracy capacitance manometers read pressures as low as 10-5 torr with accuracies of 0.08% of the reading. Full scale ranges from 0.1 torr to 1000 torr are available. Some sensors are bakeable to 400°C. These are expensive instruments and they are used when accurate pressure measurements from atmosphere to a small fraction of a torr are required. Figure 2. 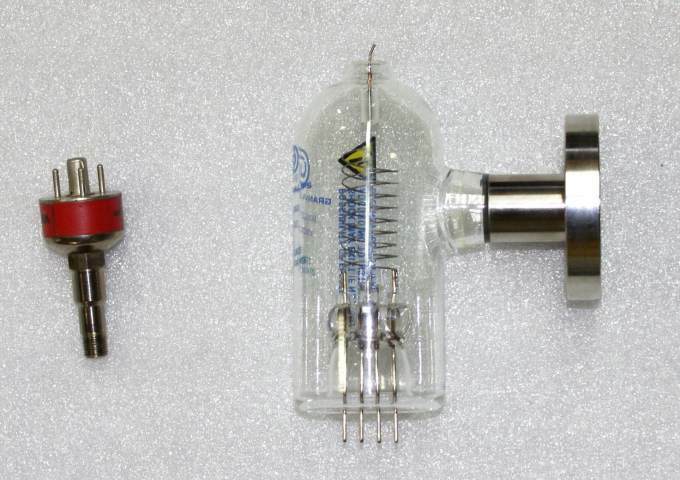 Thermocouple (left) and Hot Cathode Ionization (right) gauge tubes. Thermoconduction Gauges: Gauges based on thermal conduction are probably the most widespread type of vacuum gauge in use today. If two surfaces are separated by a static layer of gas then at high pressures, where the mean free path of the gas molecules is much less than the separation of the surfaces, the thermal conductivity of the gas layer will be independent of pressure. However, at low pressures, where the mean free path is less than or comparable to the separation of the surfaces, the thermal conductivity will depend on the pressure and the nature of the gas. Thermal conductivity gauges are typically useful in the 10-3 to 1 torr range. The earliest thermal conductivity vacuum gauge reported is the Pirani or "1 wire" thermal conductivity gauge, invented by Marcello Pirani in 1906. In this gauge, the heat loss from a single hot filament is used to measure the pressure. Without sophisticated readout electronics, the change in resistivity of the filament with temperature was used to measure pressure in early versions of this gauge. Today many Pirani gauge controllers maintain the filament at a constant temperature to increase the range and decrease the response time of the gauge. Thermocouple gauges or a "two wire gauge" use a hot filament and separate thermocouple to measure the temperature of the filament. Thermal conductivity gauges are typically calibrated for nitrogen and a correction factor must be applied for other gases (about 10% for helium). Above approximately 1 torr the thermal conductivity of gasses changes little with pressure; however, heat transfer due to convection does depend on pressure. Convection pressure gauges cover the range from approximately 1 torr to 1 atmosphere. Again, heat loss from a hot filament is used to measure the pressure. In this case, the size and shape of the element are chosen to maximize convection losses. The calibration of these gauges is sensitive to the orientation of the head and is quite sensitive to the composition of the gas. It is common for commercially available thermocouple gauges to be designed to use both convection and conduction principles in their operation. This extends the range of a single instrument from 10-3 torr to atmospheric pressure. Strain gauges and thermal conductivity gauges are not intended for high vacuum applications and are generally not bakeable. They are available in materials that are compatible with corrosive environments and they are not significantly affected by magnetic fields. Ionization Gauges: To measure lower pressures, ionization gauges are frequently used. There are two general types of ionization gauges; hot filament ionization gauges and cold cathode ionization gauges. They both cover the range of approximately 10-2 torr to 10-9 torr and both are based on the same principle; ionization of the background gas and measurement of the resulting current. Modern Bayard Alpert ionization gauges grew out of the triode vacuum gauge introduced in 1913. In this gauge a hot filament serves as the cathode, producing electrons by thermionic emission. These electrons are accelerated toward a grid through a potential difference typically around 150V. Ions produced near the grid are accelerated toward a collector through a potential difference that is typically about 180V. At low pressures the ion current is expected to be linear with pressure, however, the nature of the residual gas and the ease with which it is ionized will affect the sensitivity of the reading. When electrons strike the filament, soft x-rays are emitted. Some of these x-rays will strike the collector and cause an electron to be emitted by the photoelectric effect. This electron will be accelerated back toward the grid, canceling part of the ion current. At low pressures this effect limits the accuracy of the pressure measurement. Figure 3. Elements of a Hot Cathode Ionization Gauge. Cold cathode gauges were once frequently referred to as Penning Gauges, although strictly speaking, the Penning gauge is just one type of cold cathode gauge. As its name implies this gauge has no heated cathode. It also has no grid. 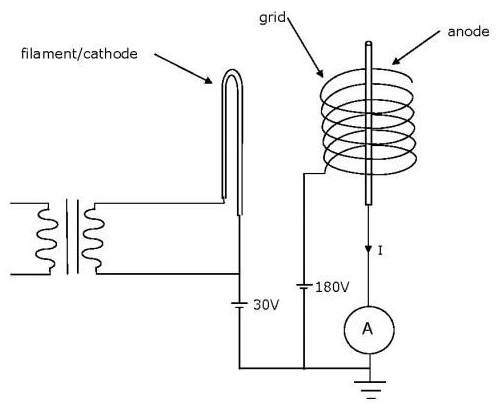 The cold cathode gauge has a permanent magnet which applies a magnetic field perpendicular to the electric field between the anode and the cathode. A high voltage is applied between the anode and cathode (typically 2kV-5kV). Electrons traveling from the cathode toward the anode are bent into a spiral path, greatly increasing the path length and the probability that an electron will strike a gas molecule and cause ionization. The relationship between ionization current and pressure is not a simple linear one. 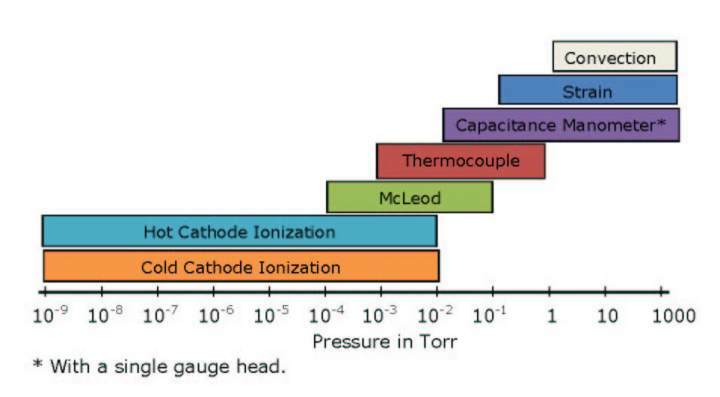 The relative merits of cold and hot cathode gauges have been debated by many authors. Cold cathode gauges are often regarded as more durable, while hot filament gauges are often regarded as more accurate. Hot cathode gauges introduce background gases into the system when the filament is initially heated and degasses, while cold cathode gauges can give deceptive readings if contaminated. The best choice of gauge will depend on the particular application. Both types of gauges are available in versions that are bakeable. In the case of cold cathode gauges, this requires removal of the magnet. Both types of gauges can be affected by external magnetic fields. Of the vacuum gauges considered so far, only strain gauges are inherently sensitive to ionizing radiation. Radiation damage to the thin sensing element can cause the gauge’s resistance to change. Many gauge manufacturers are now placing readout electronics on the gauge head. While the sensor itself may be impervious to radiation, the readout electronics is generally sensitive to radiation. In a high radiation environment is advisable to use a simple gauge head only, with the readout electronics located in a shielded area. There are other specialized vacuum gauges which have been in use for many years and are still available today. The McLeod Gauge, introduced in 1874, was the first high vacuum gauge. The McLeod gauge uses mercury to isolate a known volume of gas from the system and compress that gas to a point where the pressure can be measured by a manometer. McLeod gauges are available today which operate at pressures as low as 10-6 torr. The viscosity of residual gas was used to measure low pressures as early as 1887. Today the Spinning Rotor Gauge is used as a transfer standard at pressures as low as 5 x 10-7 torr. In addition to simple pressure measurements, the Residual Gas Analyzer (RGA) is a mass spectrometer which can identify the components of the residual gas in a vacuum system. In effect, the RGA provides not just a total pressure but also a breakdown of the partial pressures of the residual gas components. This can be particularly important in achieving ultra-high vacuum levels. The helium mass spectrometer leak detector is a mass spectrometer tuned to mass 4, allowing helium to be used as a tracer gas in order to locate leaks. At Meyer Tool, we fabricate vacuum vessels for a range of pressures and service conditions. Our experience in vacuum technology enables us to assist you in selecting the correct gauging for your application, Reduce Project Risk and help you to achieve the lowest total cost of ownership.